On May 4, 2004, in the Cardinals’ first appearance at Philadelphia’s Citizens Bank Park, closer Jason Isringhausen recorded a save, but it should have been credited to his catcher. In the bottom of the ninth, with the Cardinals ahead, 6-5, the Phillies loaded the bases with two outs against Isringhausen. Pat Burrell, the Phillies left fielder who had hit a home run off starter Chris Carpenter in the fifth inning, stepped to the plate. With the count 2-and-2, Burrell fouled off three consecutive 94 mph pitches from Isringhausen. For the eighth pitch of the matchup, Matheny called for a cut fastball down and away. The catcher positioned himself accordingly. Isringhausen, however, delivered a pitch high and inside. Burrell took a mighty rip. It appeared to some, including Isringhausen, that Burrell’s swing had resulted in a foul tip, because the ball sailed past Matheny and umpire Kerwin Danley and rocketed toward the brick backstop in front of the stands behind home plate. “I thought it was a foul tip,” La Russa said to the Philadelphia Inquirer. Matheny, who couldn’t shift in time to catch the pitch, knew Burrell had swung and missed for strike three. Burrell knew it, too, and he barreled toward first base. Matheny, his mind on overdrive, turned and pursued the ball, which, fortunately for the Cardinals, ricocheted off the backstop and toward the catcher. Retrieving the ball, Matheny whirled, quickly determined he had no chance to nail Marlon Byrd racing from third to home, and fired “almost blindly,” wrote Strauss, to first baseman Albert Pujols. Matheny’s accurate missile beat Burrell by a half step for the third out and a 6-5 Cardinals victory. 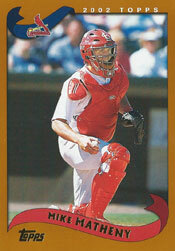 Matheny would win his third of four career Gold Glove awards in 2004. He also led National League catchers in fielding percentage at .999 that season, committing one error in 977.2 innings caught.